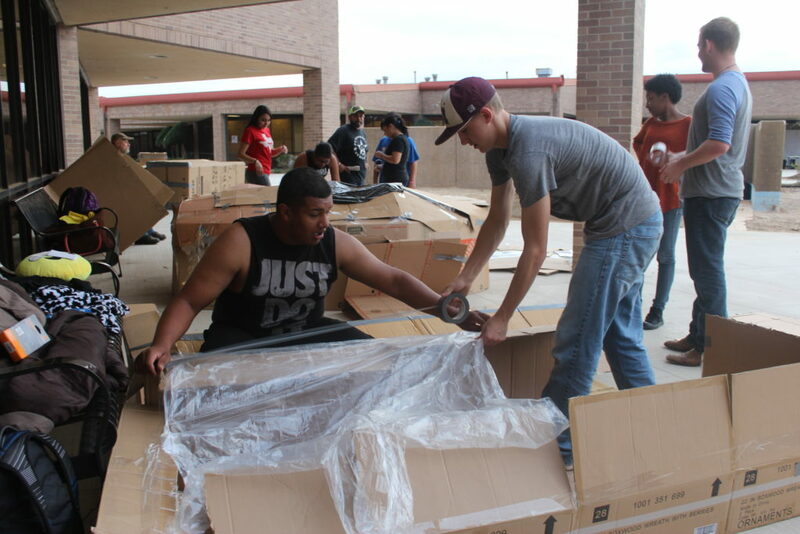 Multiple NTCC students assemble their shelter and prepare to spend the night in a cardboard box during last year’s event. The event is part of Student Success Services and the Social Work Program to raise awareness about the homeless population. NTCC students and local community members are invited to spend a night outdoors on the NTCC campus as a way to gain an understanding of the plight of the homeless. The group hosted the event two years ago, and were encouraged by those who participated to repeat the awareness activity again this fall. This year’s event begins Thursday, Nov. 15, at 5 p.m. and ends at 6 a.m. on Friday with a bread and coffee breakfast. Students 12 to 17 may also participate with parental consent. All participants are asked to bring three nonperishable items to donate to the student food pantry. The event will take place despite weather conditions. NTCC student Oscar Gonzalez, a social work major, is helping organize this year’s event. “Last time we had about 100 people show up, so this year we’re expecting about the same,” Gonzales said. Homeless families often sleep outside, with little or no shelter, in pouring rain or in the hot, sticky Texas heat. It is exhausting, dirty and many are hungry. Carmen Shurtleff, NTCC associate faculty for social work, says the rules for the evening are designed to provide students with a taste of the physical discomfort the homeless endure. Participants are allowed to bring only the clothes on their back and one blanket. No pillows, no food, no devices. Boxes will be provided and should be set up under building awnings. Homelessness is much more visible in urban centers. According to data from a March 2018 homeless census reported in the Dallas Morning News, the number of homeless people in Dallas and Collin counties jumped 9 percent year after year. On the night the census was taken, more than 4,000 were counted as homeless. She said that locally homelessness is often seen as multiple families living in one small space or people living in motels or on a friend’s couch. The NTCC Student Success Services department is also helping sponsor the event. Erika Garza, academic success coach director, said she hopes the event will also bring awareness to challenges that some NTCC students also face. “On a daily basic we coach high achieving students who lack basic resources including access to food, running water and transportation,” she said. The hope, said Shurtleff, is that the experience fosters empathy in participants along with a greater social awareness and a deeper appreciation of their own homes.